If architectural judgment were a city, a city of ideas and forms, then it is a very imperfect city. When architects judge the success or failure of a building, the range of ways and criteria which can be used for this evaluation causes many contentious and discordant arguments. 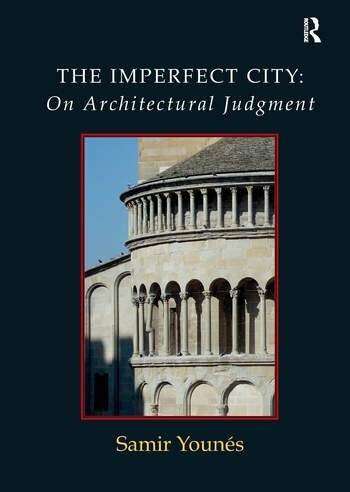 Proposing that the increase in number and intensity of such arguments threatens to destabilize the very grounds upon which judgment is supposed to rest, this book examines architectural judgment in its historical, cultural, political, and psychological dimensions and their convergence on that most expressive part of architecture, namely: architectural character. It stresses the value of reasoned judgment in justifying architectural form -a judgment based on three sets of criteria: those criteria that are external to architecture, those that are internal to architecture, and those that pertain to the psychology of the architect as image-maker. External criteria include, philosophies of history or theories of modernity; internal criteria include architectural character and architectural composition; while the psychological criteria pertain to 'mimetic rivalry', or rivaling desires for the same architectural forms. Yet, although architectural conflicts can adversely influence judgment, they can at the same time, contribute to the advancement of architectural culture. Contents: Introduction; Part 1 External Criteria for Architectural Judgment: Architectural judgment based on history, part 1; Architectural judgment based on history, part 2; Architectural judgment based on history, part 3; On the nature of modernity; Political content and architectural form; Desire, imitation, and conflict. Part 2 Internal Criteria for Architectural Judgment. The Faces of Character: Architectural expression: form, quality and purpose; Character, imitation and invention: a discussion of three historic moments; The limits of architectural expression; Conclusion: the usefulness of conflict for judgment; Bibliography; Index. Samir Younés is a Professor of architecture at the University of Notre Dame where he was Director of Rome Studies in Architecture. He is also the author of The True, the Fictive, and the Real. The Historical Dictionary of Architecture of Quatremère de Quincy.